Are you ready for San Diego Comic-Con? IDW Publishing is. This week the publisher previewed all its SDCC 2017 exclusives–and there’s something for everyone. 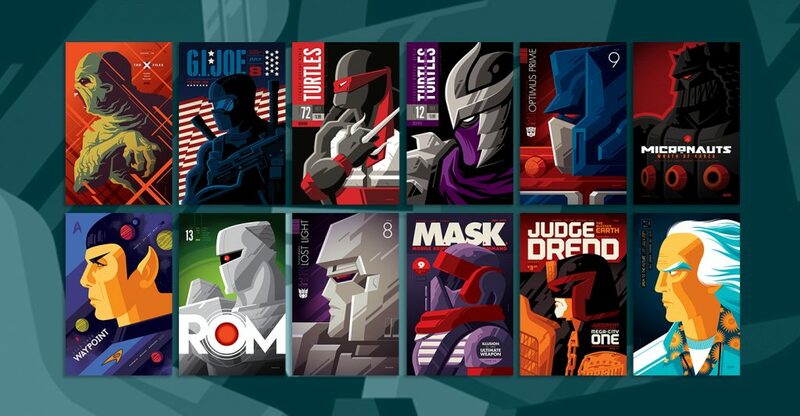 Select exclusives are now available for pre-order at IDW’s webstore here. 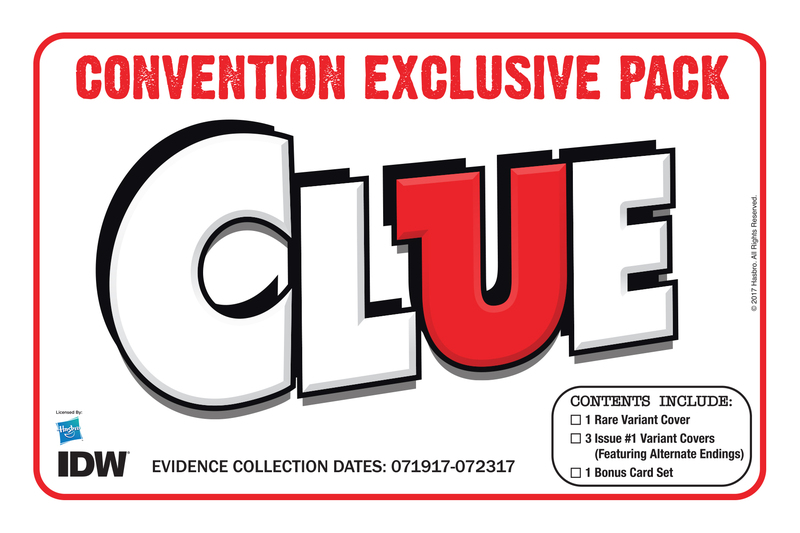 Clue #1 Envelope pack, includes spot color variant plus 3 regular covers and a bonus spot-color cover by Gabriel Rodriguez. $20. Limited to 500 packs. 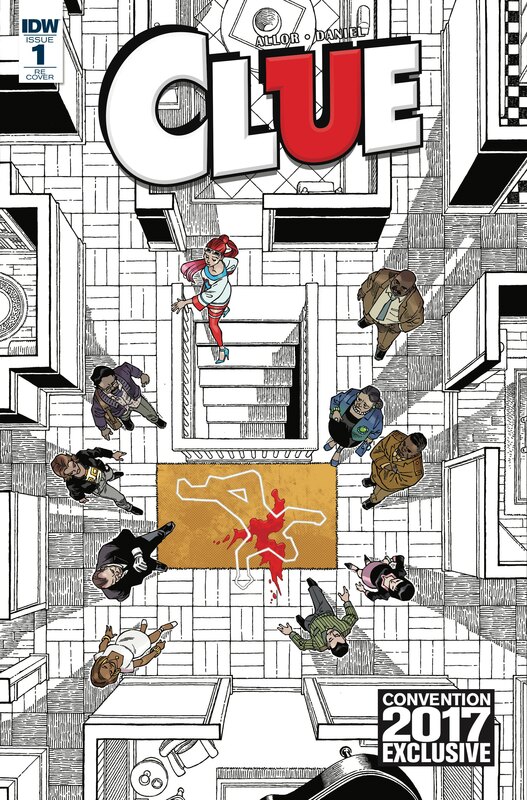 Follow the clues and solve the mystery in IDW’s new Clue series. Includes exclusive Gabriel Rodriguez Con variant cover, only available in this pack, includes all three regular editions with the alternate endings, and a full set of rare Clue promotional trading cards, all tucked neatly into a Clue evidence envelope. All the familiar faces from the famous board game are back, with a couple new twists. Written by Mike Carey and Arvind Ethan David, Darkness Visible tells the story of an uneasy co-existence between humans and demons that lasted eighty years, is now spawning an endless terrorist conflict, with a cover by Ryan Kelly. Bone creator Jeff Smith drew a variant cover of the DuckTales cast for this convention variant. Featuring characters like Uncle Scrooge, Donald Duck, and Huey, Dewey and Louie, this new #0 issue is a jumping on point for fans old and new in anticipation of the brand-new series coming Summer 2017. Various artists. $25. Limited to 100 packs. Pick up all five of IDW’s Funko Universe one-shot comics from May, each with a cover modeled after the popular Funko boxes, and get a free bonus copy of TMNT #70 with a Funko-style cover by artist Dave Alvarez. The only way to get this variant is to buy this bundle pack. $10. Limited to 400 copies. The stars of the hit television show will be on hand at the convention to sign a special photo variant cover available only at the show. And for the ultimate collectors a deluxe pack will be available collecting the convention variant, last year’s San Diego variant cover, and a bonus item. $10. Limited to 300 copies. Includes special convention photo variant cover, filled with on-set photos, including action shots from the show and all-new behind-the-scenes goodies. This is a book all Earpers need in their motorcycle saddle bag. Wynonna Earp #1 Deluxe Pack, 2 special photo variants featuring cast members from the hit show. $20. Limited to 150 packs. Get the last two Wynonna Earp Convention Variant comics with a free bonus item. $10. Limited to 400 copies. This time, everybody answers the call. Ghostbusters 101 features the very first appearance of the new Ghostbusters from 2016’s Answer the Call movie, as they team up with the original Ghostbusters from 1984. This convention variant features a photo cover of the original Ghostbusters on the front cover, and a photo of the new team on the back cover. 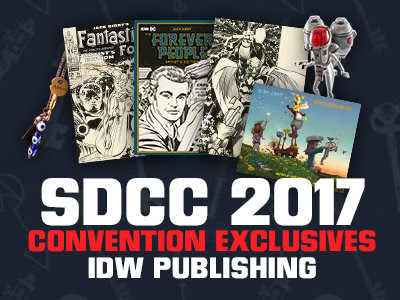 Visitors can get copies signed at SDCC 2017. $10. Limited to 250 copies. Artist Erica Henderson (Unbeatable Squirrel Girl) drew the variant cover of Jem & the Holograms for Part 1 of the first-ever Jem/Misfits crossover event, written by Kelly Thompson. $5. Limited to 500 copies. This fall My Little Pony: The Movie hits theaters, and this prequel mini-series is your first look at the fantastic adventure to come, with a fabulous new cover by artist Tony Fleecs. $10. Limited to 250 copies. Alex Milne provides the variant cover to this crossover hundreds of years in the making. See the first interactions between ROM and the Transformers on Earth, and meet the universe’s only Cybertronian Solstar Knight. $10. Limited to 500 copies. TMNT co-creator Kevin Eastman and Usagi Yojimbo creator Stan Sakai collaborated on the convention variant. The TMNT are teleported to a world of talking animals—the world of Usagi Yojimbo. Visitors can get their copies signed at the booth. $20. Limited to 300 copies. 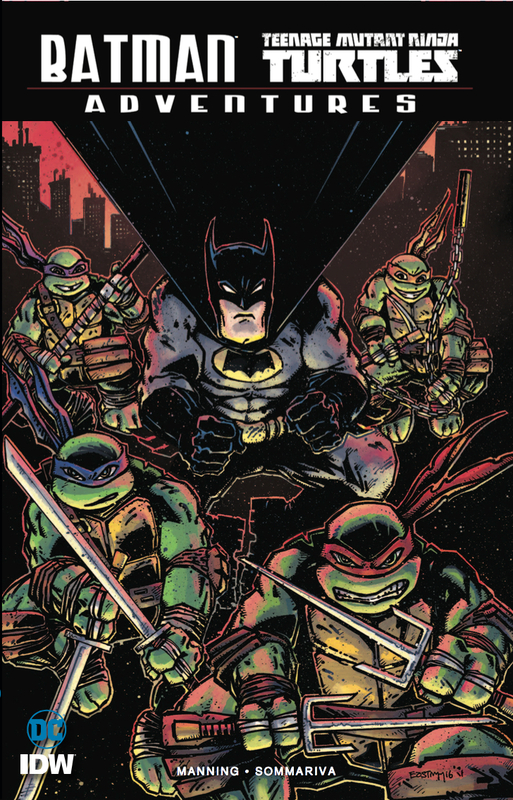 TMNT co-creator Kevin Eastman provides a con-exclusive cover to this trade paperback. The animated worlds of the current Teenage Mutant Ninja Turtles Nickelodeon cartoon and Batman: The Animated Series collide in this mini-series featuring characters from both universes. Bloom County: Brand Spanking New Day Hardcover, First release at SDCC. $40. 400 copies at the show. Get a special hardcover version of the latest collection of Berkeley Breathed’s recently revived Bloom County comic strip. This book, containing a bound in plate signed by Breathed, features all-new strips from 2016 and 2017, that have never appeared in print before. These newly-minted masterpieces present the continuing adventures of Opus, Bill the Cat, Steve Dallas, and the rest of the delightful denizens of Bloom County. $150. Limited to 100 copies. 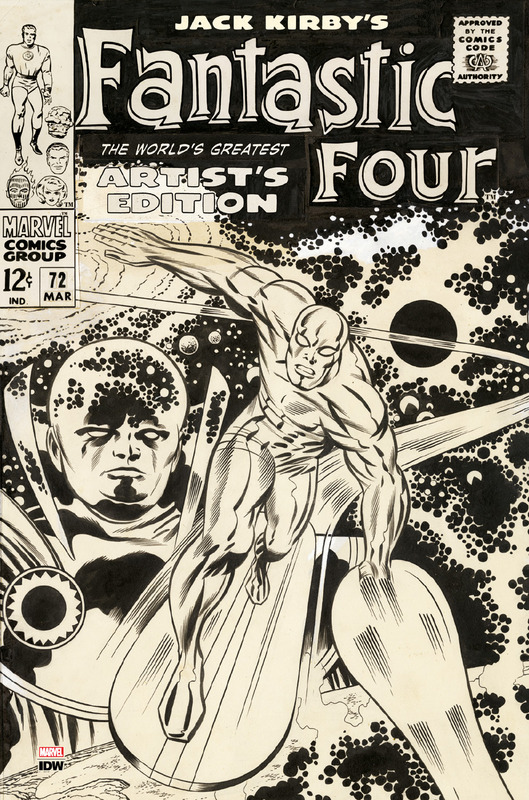 Jack Kirby was the undisputed King of Comics and IDW is proud to present the second Artist’s Edition focusing on his Fantastic Four work. And, even better, this collects his earlier, “twice up” art—it’s Kirby-sized. This massive collection includes issues 33, 45, 47, and 60 of the Fantastic Four, plus a stellar gallery with 22 (!!) classic covers, and incredible pages, and three gigantic fold-outs. Debuting at this year’s SDCC is the variant cover featuring Fantastic Four #72. $125. Limited to 100 copies. Continuing IDW’s yearlong celebration of the centennial of Jack Kirby’s birth. Jack Kirby’s classic Fourth World epic told the story of a group of New Gods sent to Earth to oppose Darkseid. Featuring Beautiful Dreamer, Big Bear, Moonrider, and others, this was Kirby’s take on super-powered flower children. Included in this volume are issues, 1, 4, 5, 6, and 7, with nearly all pages scanned from the originals. Debuting at this year’s SDCC is the variant cover featuring a self-portrait of Jack Kirby, and this is limited to a scarce 100 copies. $20. Limited to 500 copies. This special deluxe release hardcover, with a new cover by series artist Gabriel Rodriguez, finally reprints the oft-requested and long-denied Eisner-winning one-shot, “Open the Moon!”, the other long-sold-out one-shot, “Grindhouse!” and the even more hard-to-find IDW 10th anniversary Locke & Key tale, “In the Can!”, along with additional covers, behind-the-scenes photos and more. $30. Limited to 500 copies. This convention edition hardcover, with a new cover by creator Walter Simonson, collects issues #7-12 of the Ragnarök series. After hundreds of years, a single god emerged into the post-Ragnarök world, Thor, the God of Thunder. But Angantyr, the Lord of the Dead, has discovered his reappearance, and unleashes his draugar, the undead walkers, against the Thunder God, seeking to destroy the last vestige of the former worlds, and the only hope for the present one. $35. 150 copies at the show. Blending clockwork whimsy with art-nouveau visuals, Jim McCann and Janet Lee present a hand-crafted fairy tale that feels both familiar and entirely new in this prestige reprinting. $15. 500 copies at the show. $20. Limited to 200 copies. All-new Star Trek series following the adventures of Captain Kirk and the iconic crew. New worlds. New species. New ships. New photo cover for the con variant. $15. 150 copies at the show. Things are getting weird in Surfside. Lately, Samantha’s best friend Jade explodes into fits of giggles whenever she sees a boy, and it’s throwing a wrench into the kick-back summer of surfing and hanging out that Sam had planned. But after swimming through a secret underwater cave, Sam starts to… see things. Like ghosts. And strange creatures. And maybe something even scarier. Can she and Jade get to the bottom of this mystery in time to save their town? $125. Limited to 100 copies. The fate of Earth and Asgard hang in the Balance as Thor, Beta Ray Bill, and tons of guest-stars do battle Surtur and his horde of invading demons. All with an exclusive Simonson cover just for the con variant featuring the very first drawing ever done of Beta Ray Bill. The second Thor Artist’s Edition by the legendary comics’ creator Walter Simonson. Featuring seven complete issues of The Mighty Thor (#349 – 354, plus #380—the legendary all-splash page story). As with all Artist’s Editions, each page of art scanned from the original art, in this case, from Simonson’s personal archives. $100. Limited to 100 copies. Official Disney Archive print of the DuckTales #0 SDCC Variant cover by Bone creator Jeff Smith. Each print measures 11.7 by 16.5 inches, is hand-numbered from 1 to 100, and is printed on 51 pound paper. Each print is packaged in a 13″x18″ envelope with a Official Disney Archive label on the front. Visitors can get it signed by Jeff Smith and DuckTales creators during the convention. $100. Limited to 50. This String Divers F Defender Statue is a IDW x THREEA SDCC 2017 Exclusive, designed by Ashley Wood. Limited to only 50 units, this statue stands approximately 6” tall, and features 25 points of articulation. This statue also comes with 1 Quantum Defense Suit, 1 Quantum Propulsion Pack, 3 Weapons, and 1 Stand. A free copy of the String Divers Trade Paperback with purchase. $100. Limited to 50. Want to wear the same style necklace as Melanie Scrofano wears on Wynonna Earp? Here’s your chance to get an authentic replica necklace. 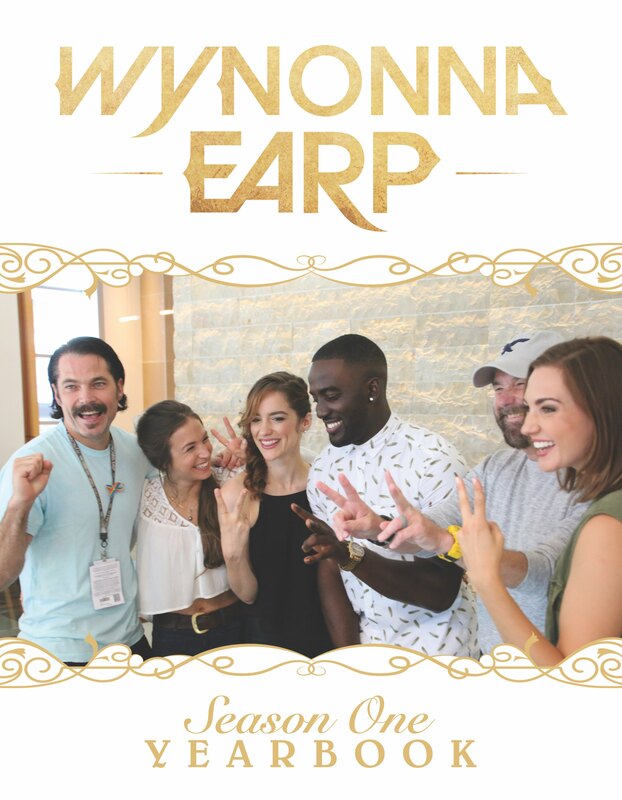 As a free bonus, IDW is including a comic book signed by Doc Holliday himself, Tim Rozon, a comic book signed by Katherine Barrell (Officer Haught) and the Wynonna Earp Season 1 Yearbook. $10. Limited to 100 for each design. Tom Whalen Poster Bundles: A curated assembly of hardcovers, trade paperbacks and rare variant covers, includes a free high-quality poster. $100 each. 2 bundles per day, each bundle limited to 50 units. Get a sneak peek at some of the most exciting titles coming this fall with these giveaways available at the IDW booth throughout the show. Get your first look at what’s coming from Shelly Bond’s Black Crown imprint, including Kid Lobotomy by Peter Milligan and Tess Fowler, plus more yet-to-be-announced titles. Get on the ground floor of this summer’s Hasbro Comic Book Event Series featuring Transformers, G.I. Joe, Rom, and more. Look no further for some engaging summer reading from some of your favorite creators. You don’t have to travel to a galaxy far, far away to get a look at the new all-ages Star Wars Adventures comic series. Writer/artist Gabriel Rodriguez (Locke & Key) welcomes you to a world unlike anything you’ve seen before in this sci-fi/fantasy epic. The 5-week event series coming this August where the Teenage Mutant Ninja Turtles return to Dimension X starts here. Based on the Disney animated shows. Those who enter the Diablo House get more than what they bargained for. Before the movie opens in theaters, snag this poster before they’re gone in a Rainbow Dash. Note: These convention exclusives are only available for pick up at IDW’s SDCC booth #2743 throughout the convention or at the San Diego Comic Art Gallery from July 21st through July 24th. The gallery, located in the Liberty Station Arts District in the Point Loma area of San Diego, currently features exhibits by acclaimed artists Kevin Eastman (Teenage Mutant Ninja Turtles) and Walter Simonson (Thor, Ragnarök).